Listening to Ed Sheeran at 12:22 am and it's raining outside. Perfect time to blog. Also, 'cause I'm not sleepy. Shall blog about London and how fun it was. Really missing it now albeit the countless times I wished I were home when I was there much thanks to the dreadful cold weather ! Not made for winter lah serious. Tok Aa's cosy flat in Acton was our make shift home for our 3 week stay there. 3 minute walk to Morrison's so guess where we shopped first once we landed in London town ? Yep, you guessed it. Morrison's ! I was so giddy over everything because everything was so prettily packaged and nampak sedap gila ??? I especially became most excited when I saw the orange flavoured Kit Kat ! It was here in KL for the shortest period of time before it got axed. I've heard so many people say that it's not nice but I love it!!! Anyway. Moving on. I loooooooove London ! More than anything, the trip has just fueled my determination to study there because of how much I love the UK. From the people (ESPECIALLY the people) to the M&S food hall to the transport system, I just love love love the UK. I had the best 3 weeks holiday and really, it has made me want to study there next year even more. InsyaAllah. We went everywhere...... 'cept for Winter Wonderland only 'cause it was too cold for us to leave after 6 to Hyde Park hahahaha. We were usually back home by dinner because all of us tak tahan sejuk (k fine maybe just me and Mama) so we (read: "I") insisted to have dinner at home. When people ask me how was London, I merely reply and sum it up in one word - cold. Really! My mates in London now are probably scoffing at how weak I am because it's a relatively warm winter now compared to when I was there late November. Cis bedebah! "So Melayu lah you!" my parents would say after I get up from my chair to get myself a 2nd helping of rice. Watch as I tambah nasi. .... so what do we do on the 2nd day ? We go to Oxford Street. Sigh. We will never learn! But Oxford Street/Marble Arch/Bond Street can all be counted as sight seeing riiiight ? Also, look at how unprepared I was for London! The atrocious flats with socks blunder ! The horror. Bought my River Island creepers on the 3rd day because this got too embarrassing. Ahhh Selfridges! Bought my NARS powder here when really, in fact, I could have gotten it anywhere else. But I had to get that yellow paper bag some way or another kan ? And Papa introduced us to his favourite ever salt beef sandwiches. 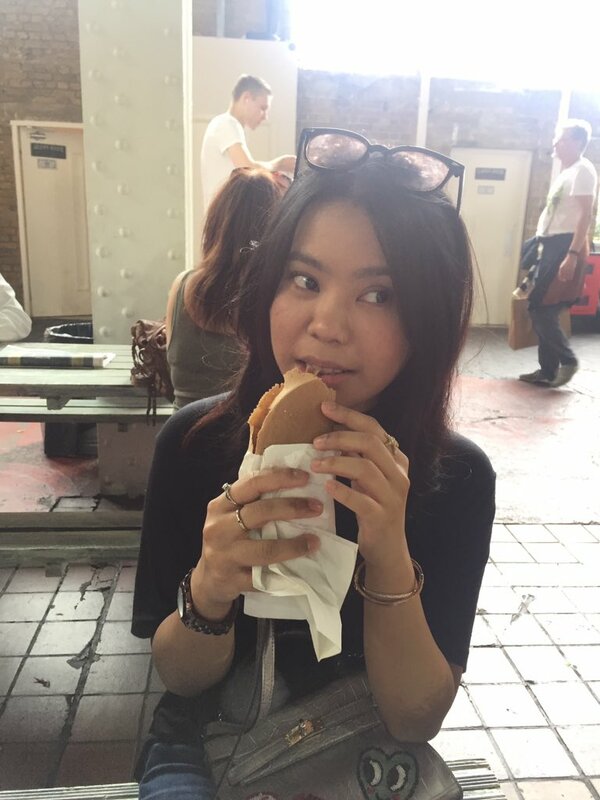 Tried it and mleh, I preferred the egg mayo sandwich from M&S Food Hall lolol seriously the UK has the best sandwiches I don't even know how that's possible.... maybe it's the bread. No, yeah definitely the bread. Us at Selfridges, waiting for our sandwiches. 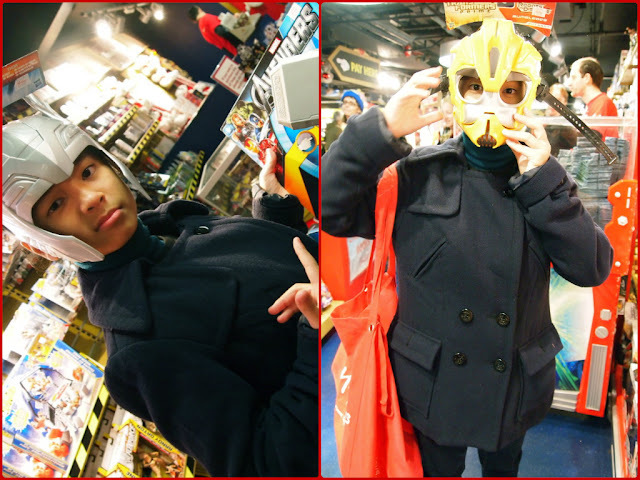 Last I went to London was when I was about 7-8, and by then Iman was only a baby so she didn't travel with us and consequently, missed our Hamleys experience where we tried on cool masks and did everything a kid should do. We have it on video and everytime we watch it, Iman feels left out 'cause she wasn't there at the time. So this time 'round, Papa brought her to Hamleys and it was her turn to FEEL THE ULTIMATE HAMLEYS EXPERIENCE. Only this time, Mama and Papa were too lazy to accompany her around the store like how they did with us. So I volunteered and gave her the tour. ... and played games with the FRIENDLIEST shop assistants ever !! 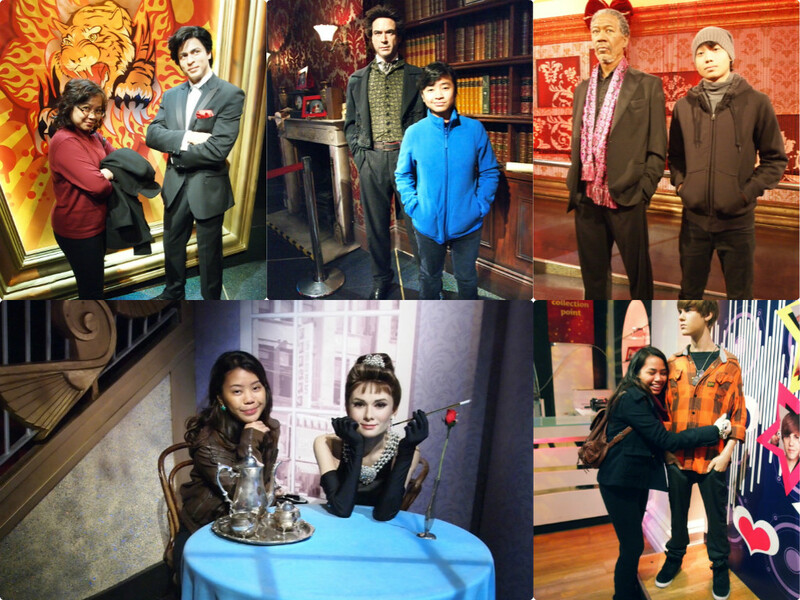 Also, if you're in London, how can you not go for Madame Tussauds ? I've never been to one so I was stoked to finally go and touch and take photos with famous people albeit waxed. It was sooooo ~ much fun ! Had to take double takes at times 'cause some looked so real. Now, I really wanna go to the ones in America; imagine the waxed figures there ! 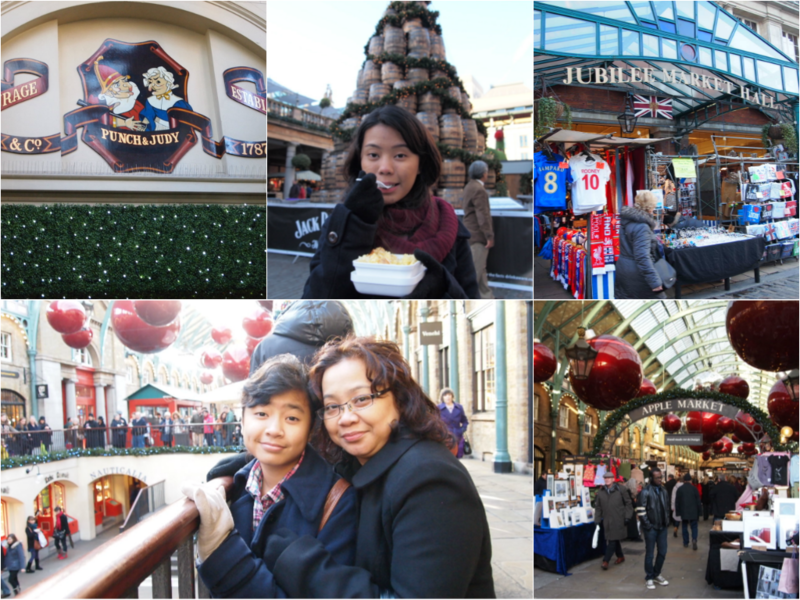 Went to Covent Garden for fun. Came across one of the best baked potatoes eva. Maybe 'cause it was something hot I could consume before the cold got to my body and freeze me over. Potato covered in cheese; holy shmoly y'all missin' out on life if you don't try 'em once you're in London or anywhere in the UK for that matter. Really regretting not going into the Laduree shop there ! Such a cool place to get knick knacks and the food they were selling were so tempting. 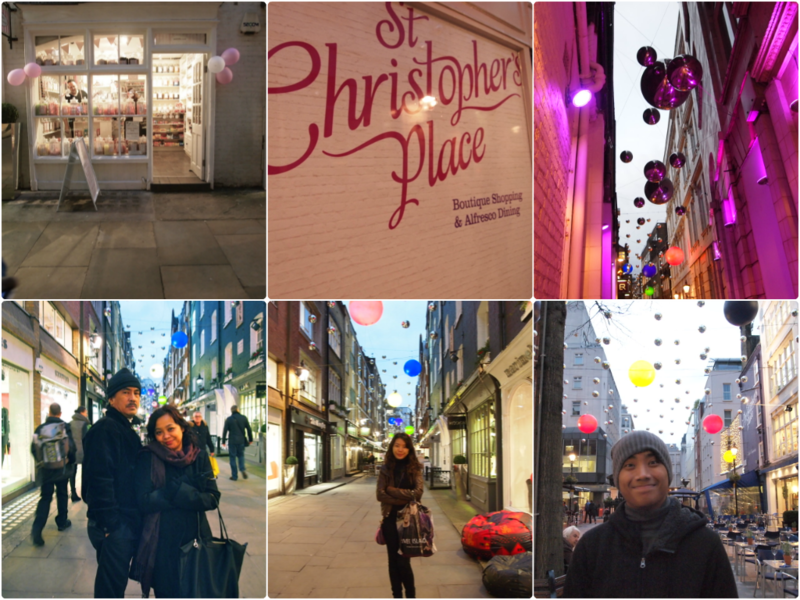 Amidst our Oxford Street shopping, Papa brought us to this narrow alley that led us to St. Christopher's Place. So pretty the lights ! Had the coolest quaint shops and restaurants and looked and felt like a escape route from the hustle and bustle of London streets. Phew ! Y'all tired yet of the heavy duty collages ? Gon' call it a night and continue my London post in the next few blog entries. So many photos but alas, this ain't Tumblr and I'm not up fer it even if it was. Uncle Kusy's marrieddddd ! The last of Tok Wan and Tok Teh's (my grandmother's parents) cucu. And next is their cicit-cicit. I don't know who'll get married next but I've already plan my wedding waaaaay ahead. 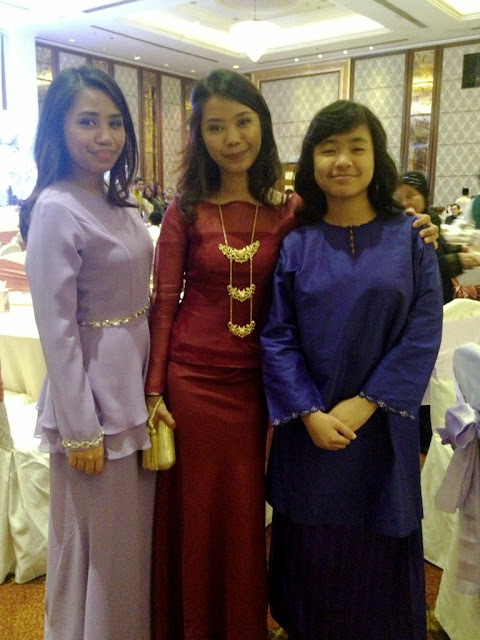 Love weddings and can't wait to get married lol lek lek A-Levels pun tak habis lagi lek. 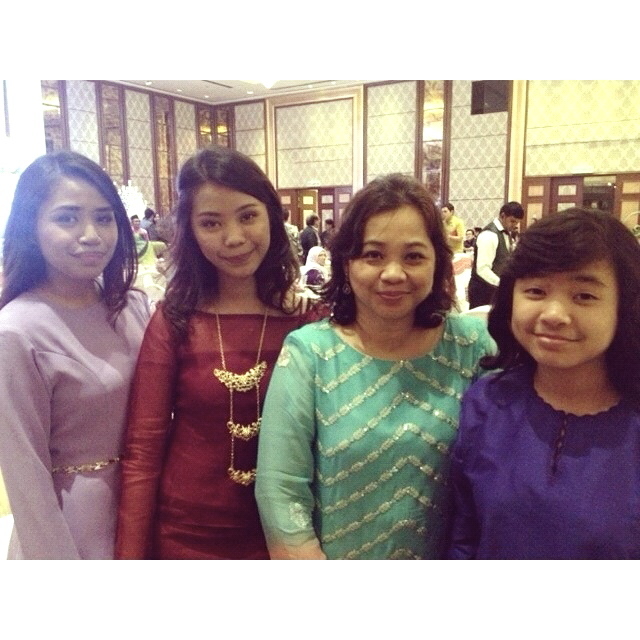 Liked my green baju raya so much, I had one made in red. 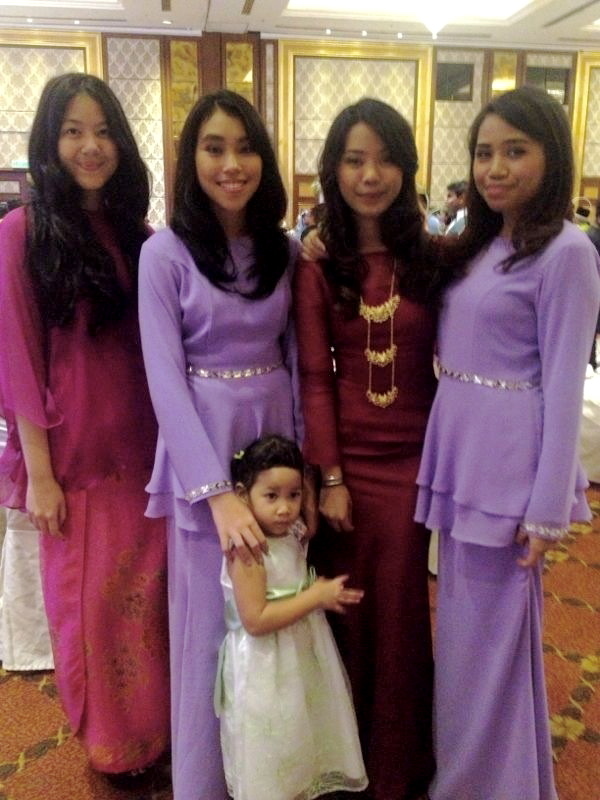 Tania and Misha were the flower girls so that explains their baju. So pretty!! Congratulations Uncle Kusy and Kak Hany (yeah I call them by 'Uncle' and 'Kak') (because Kak Hany is 4 years my senior; so weird to be calling her Aunty!) (Uncle Kusy takpe) !!! May your marriage be blessed and to Kak Hany, welcome to the family!!! I love being around the bunch of friends I spend my high school years with. 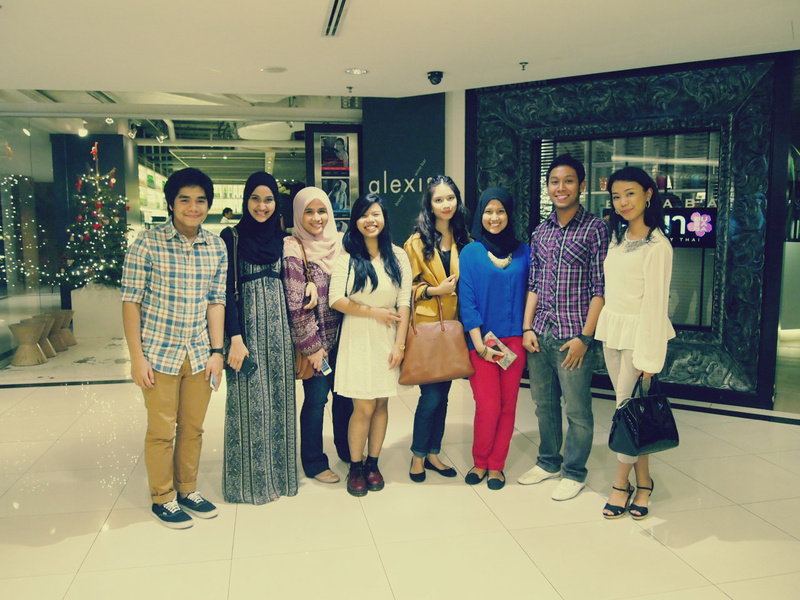 Spent some good quality dinner time with Ila, Dina, Suraya, Aimi, Yus, Hafeez and Hanan at Alexis, BSC. Sooooooo upset that they ran out of pavlova's though. 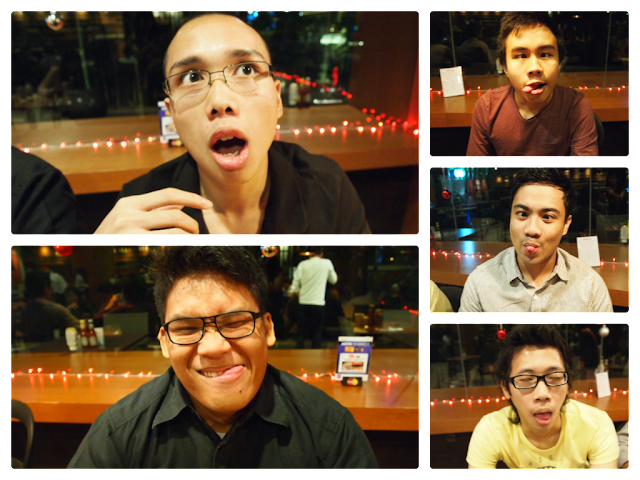 Had a great time laughing and eating with the bunch and really, I wouldn't trade them for the world ! There's a great quote out there on Tumblr that said that your friends now from college or from university or from work know you the way you are now but it's your high school friends who know why you are the way you are now. And I thought that was so true and apt. Watched Perks of Being A Wallflower the other day with Puch and like all American teenage flicks, high school is depicted to be such a horrid place what with all the bullying and the group segregations. But my high school years have been nothing but the best honestly. And I even had my mother teaching English there ! It's like any American girl's nightmare to have a parent as a teacher in their own high school. But it didn't matter at all to me. In fact, it was a good thing she was because it was from her that I knew my seniors ! 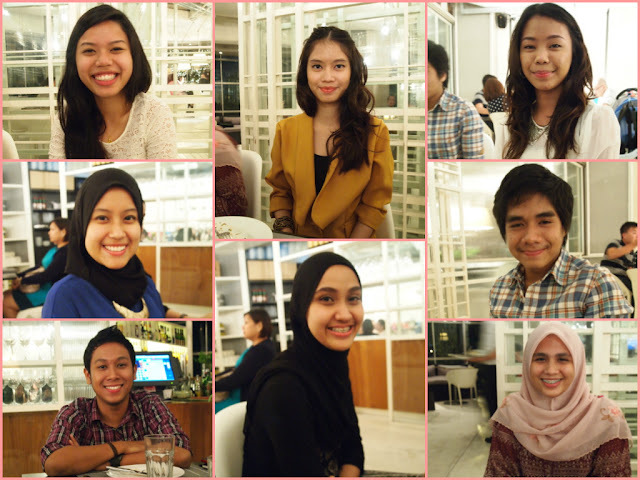 And what made my 4 years in Taman Tun to be so special was courtesy of my friends. The things I would do to be in 2007-2010 again. I wouldn't have done anything differently. I loved it sooooo much lah. I was the only one to look forward to school in my family during holidays. Leaving high school was bitter sweet though at times, I feel like it was mostly bitter than it was sweet. I would've seen my friends everyday and I'd be having a great amount of laughing with Hafeez and Dina in class. 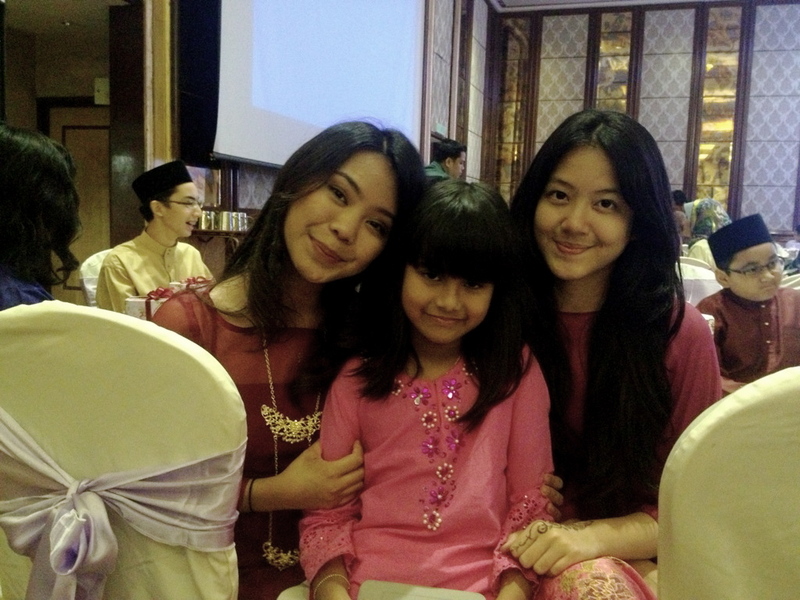 And my gossip sessions with Aimi and Ila and Sarah. And rehat with my girlssssssss. Haaaaaaa best. Really, high school was a great period in my life and I'm so thankful to have such great company with me. So meeting up with my high school mates every once in a while is always something I look forward to. Let it be a quick lepak session at Mai or a nice fancy dinner at Alexis, I look forward to reliving my high school years. Even it is for a night. We took this photo because BSC was already closing so we passed by these bean bags and we just HAD to take a photo like we own the place. Lovely time with about the loveliest bunch of friends. p/s oh and guess who has her upper braces off?!?!?! It's a few days away til the New Years and I still can't comprehend that 2012 is almost already over. Where did my year go and can I get it back? 1 What did you do in 2012 that you'd never done before? 2 Did you keep your new year's resolutions and will you make more for next year? I never keep my NY's resolution. And I'll probably still will but this time I'm going to make a really lame one and see if I can keep with that. 3 Did anyone close to you give birth? 4 Did anyone close to you die? No. Blessed and grateful to Allah for everyone still here with me. 5 What countries did you visit? London! Had a brilliant 3 week stay. Would love to go back in the Spring! 6 What would you like to have in 2013 that you lacked in 2012? 7 What dates from 2012 will remain etched upon your memory. And why? My birthday! Had the best birthday surprise from my college mates (courtesy of Mama and Tania). 8 What was your biggest achievement of the year? I drove. Hahahahahaha. After a year of getting my drivers license ! And getting my university offers was kinda cool too. 9 What was your biggest failure? Didn't live to what I wanted my results to turn out but hey ho. Wouldn't be a major thing lah but so one day right, went to the gym and worked out kaw kaw like I don't even know what got into me right and I had the worst leg cramps ever that I was limping for like 3 days! LOL. And for illness; I fell sick couple of times. Horrible! My neon patterned cardigan from H&M and my One Direction tee lolololol i swear it's the cutest thing! 12 Whose behaviour merited celebration? Hafiz Ismail for being such a trooper for what he's going through now. 13 Whose behaviour made you appalled? I spent a lot on clothes this year and make-up. 15 What did you get really really really excited about? 16 What song will always remind you of 2012? Love on Top. This song was my freaking birthday anthem! Love it. 17 Compared to this time last year, are you: (i) happier or sadder? (ii) thinner or fatter? (iii) richer or poorer? (ii) I reckoned I've gained a few pounds because I've been eating quite a lot of rice since I'm in college and all but again, pretty much the same overall. (iii) Hey, if I have a roof over my head, food to eat, clothes to wear, I'm good. Richer or poorer, I'm still living in a house with a car and constant supply of food; so nothing's changed. Happy! 18 What do you wish you'd done more of? 19 What do you wish you'd done less of? 20 How did you spend Christmas? Was in OU with my friends for a quick lunch at Madam Kwans and met Madam Kwan herself! Totes cutes. And had a nice Christmas dinner with my friends in KL. A day out with both groups of friends. 21 Did you fall in love in 2012? With 5 handsome boys of 1D. 22 What was your favourite TV program? Are you srs right now don't even start with TV programs with me. SUITS SUITS SUITS GREY'S GREY'S GREY'S. 23 Do you hate anyone now that you didn't hate this time last year? Oooooooo yep. Wish I didn't though to be honest. 24 What was the best book you read? 25 What was your greatest musical discovery? Balance and The Traveling Sounds. And Bo Amir Iqram. 26 What did you want and get? 27 What did you want and not get? 28 What was your favourite film of this year? 29 What one thing made your year immeasurably more satisfying? London. Been wanting to go since a long time ago so to finally go there was brilliant. 30 How would you describe your personal fashion concept in 2012? Easy. Plain and simple and even though I'm trying to be all cool and wear cool things, we all know I just revert back to my tee and pair of jeans by the end of the day. And yes, if I could wear my kaftan to the dining hall/cafe at night, I would. 31 What kept you sane? To be honest, there was nothing really that made me want to go INsane in the first place. 32 Which celebrity/public figure did you fancy the most? A lot. Ed Sheeran, Rebel Wilson, the cast of Suits (all of 'em), and so many others I can't seem to recall and name now. 33 What political issue stirred you the most? I'm not going to pretend like I'm SUPER involved in the world of politics but Gaza and it's ongoing issues 'stir' me in the sense that there are so many lives, young and old, being taken away. I look at photos and am immensely heartbroken. 34 Who did you miss? 35 Tell us a valuable life lesson you learned in 2012. To not take things for granted and to always be thankful for a healthy life. Also, never leave wallets in a surau. Even if it IS a surau. 36 Quote a song lyrics that sums up your year. "A tornado flew around the room before you came excuse the mess it made it usually doesn't rain in Southern California" ...... as much as this verse don't make no sense, so did my year. And I loved it. If I have better song lyrics, I'd edit it in here then later. 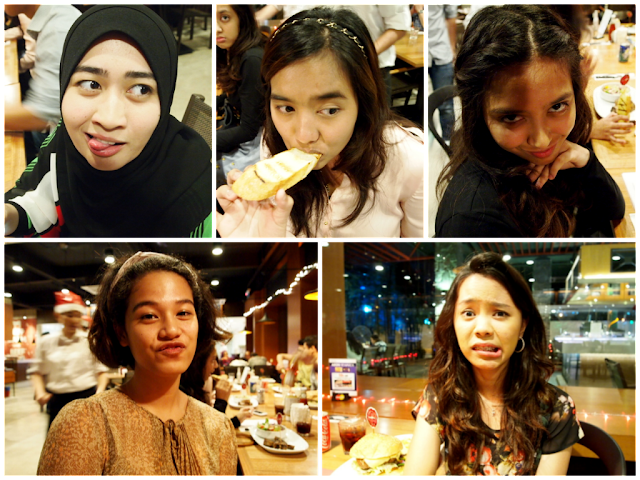 The 11 of us had dinner at Las Vacas, KL last night because we haven't had a get together in so long! So niiiiiiice to see everyone again ! 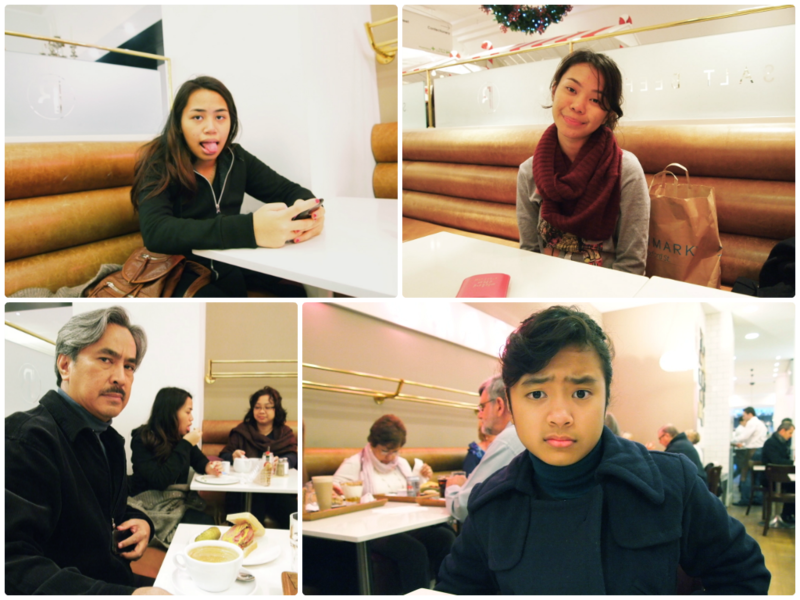 Missed the whole bunch a lot since I went to London a week before school ended. Got a ride from Sarah and we picked Tariq up before heading to Jalan Yap Kwan Seng for dinner. It's so nice and big there ! The branch in Mont Kiara is a modest one and small; not really fit for a big party like us. Had a good steady lamb burger but had Ariff to thank for finishing it! We went to Idaman in KD after that but after a drink (and after the boys learnt that their shisha flavour dah habis), we made a move to Mai pulak where we had more drinks. That's two sirap limaus under an hour ! And with a cough like mine, I really shouldn't be anywhere close to iced drinks! Earlier that day, I played my role as chaffeur and drove my sisters out. 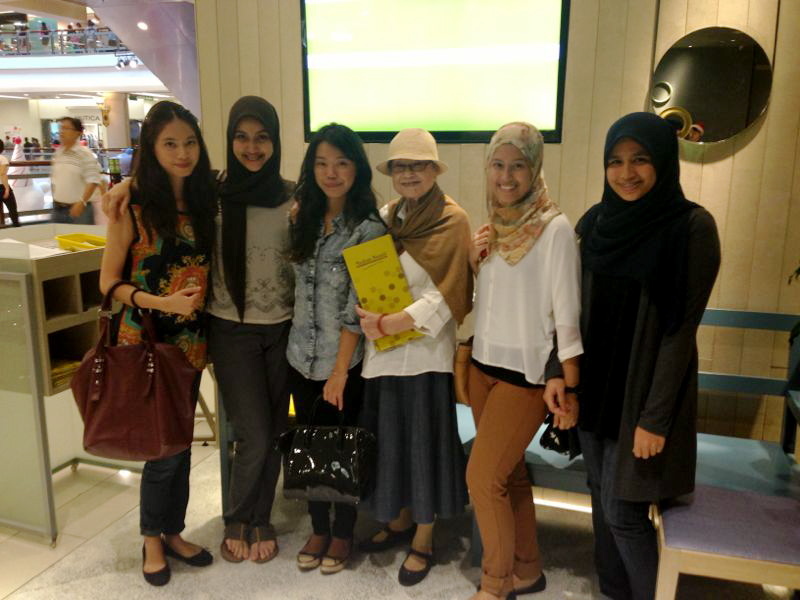 Iman had a friends birthday lunch in OU and Tania met up with her friends there as well. Figured I could FINALLY eat my teppanyaki. But half of Damansara/KL decided to spend their Christmas in OU so I couldn't find a parking for 30 whole minutes ! Bummerz. Tapi sempat tweet to my friends and made plans to have lunch somewhere. So left OU and headed for Taman Tun to fetch Suraya and Aimi and guess where we ended up picking a place to eat ? Thought we could try Madam Kwans so we did. Dina and Yus came later. Was very nice to see the girls again because I haven't seen them in AGESSSSSSSS ! Rindu a lot. Oh and guess who we took a photo with ? Madam Kwan herself !!! So funny how she had the hat and looked exactly like the cartoon caricature on the menu ! Adorbs. Can't wait for Friday night dinner with them again !!!!!!! So blessed to have myself some lovely lovely group of friends ! I haven't been outside since I got sick last Wednesday! Bleh. Tis the season to be down with a fever! So many people (about 4) (so really, not that many) are coming down with either a flu or a head on real fever on my Twitter timeline. Mine was pretty bad. So if people ask me what did I do during the 'end of the world', I basically laid in bed all day with the occasional drugged walk to the loo to throw up. Thank God that's over ! On another unrelated note, I still don't know why people make resolutions when 99% of the time, nobody really actually sticks to it. I know I don't. 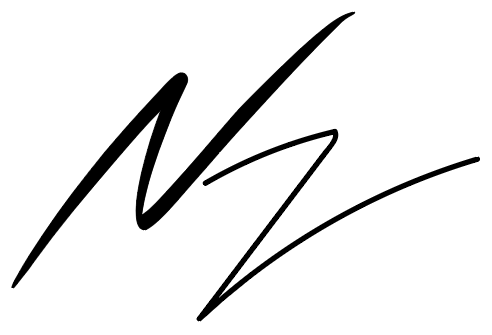 Hey, if Olan can blog then so can I! I'm back from my 3 week holiday in London ! And right now it's 7:18 in the morning and I'm in my bed waiting for everyone to wake up so I can have breakfast. But by the looks of it, I'm gonna have to wait a few more house til everyone actually does. Jet lag is no one's friend. London was amazing, of course. Couldn't have enjoyed myself more. Despite the cold and bitter weather, I had the best time there! So thankful to both my parents for everything. We don't often go for holidays abroad because it's super expensive and well, yeah, that's pretty much it. If we had all the money in the world, I'm pretty sure my dad would have brought us everywhere by now. But alas, money comes in the way and every year since we were 8, we'd spend our school holidays at home or to nearby local destinations (Penang, Langkawi, Singapore). So London was a big deal. It might not be for someone else because I mean, it seems to me that year by year most Malaysians opt for the UK for their winter holidays. I felt bad for the money being spent (though I have the best grandparents in the WORLD who gave us some pocket money for our shopping) because let's face it, London's currency is absurdly mahal. Even food got to be so expensive!! And as much as you tell yourself to not convert everything everytime (because that'll just drive you around the bend), you can't help yourself but do it anyway.